The neritic habitat includes the waters and biological communities living in the water column over the continental shelf. The neritic habitat is characterized by CMECS as including the nearshore and offshore marine subsystems, and includes the surface, upper water column, pycnocline, and lower water column layers. Neritic habitat also occurs beyond the planning area, westward to deeper oceanic habitats that start at the continental shelf break at approximately the 200 m depth contour. The waters of the neritic habitat are in constant motion. The California Current System, seasonal upwelling and downwelling, El Niño/La Niña events and changes in the Pacific Decadal Oscillation are all examples of physical events that move the waters in this habitat over varying time scales. The water is replaced many times over during an average human lifetime. The setting for the CMECS biotic component of this habitat is planktonic biota and the plankton varies with the water mass. The ecology of the neritic habitat is affected by processes taking place at scales varying from global to local. The dynamics of the neritic habitat affect all of the other habitats described later in this section. Many physical and chemical environmental factors affect neritic ecology. These factors include but are not limited to solar light and radiation influence, salinity, temperature, layer position, physical mixing, hydrostatic pressure, biogeochemical composition, atmospheric exposure and influence, surface and under water currents, swells, waves, and water mass movements. Many of these factors can change by location and time of year. The neritic habitat encompasses many water column habitats that shift, expand, and contract over time and space in both predictable and stochastic patterns. Coastal upwelling is perhaps the most defining feature of Oregon’s neritic habitat with its alternating upwelling-relaxation events. Upwelling is a water column hydroform, described by CMECS as an upwardly-directed current caused by divergence of water masses. In spring and summer months, strong northerly winds push surface and upper water layers westward towards the deep ocean. This movement causes deep, cold, oxygen-poor but nutrient-rich waters to rise to the surface near the coast replacing the water that was driven offshore. These nutrients, brought to the upper layers of the water column help propagate and sustain the rich biota of Oregon’s coastal waters. The relaxation events, when the northerly winds briefly cease or reverse, allow the upper water layer to move back towards shore bringing its rich biotic content with supplies of food, larvae, and juvenile organisms. In fall and winter months when winds blow predominantly from the south, the surface and upper water layers move shoreward and downward in a process called downwelling. Downwelling is an important part of the annual seasonal cycle that forces oxygen rich waters from the upper layers downward in the water column. Surface water temperatures provide a good indication of these seasonal wind forcing differences that bring the cold, nutrient-rich waters to the surface in the summer (Figure 6.6a) and the warmer waters from offshore to the coast in the winter Figure 6.6b). Large-scale changes in water masses, temperatures and currents result in changes in plankton species composition and abundance, which impact the survival and distribution of organisms within coastal and oceanic ecosystems. These large scale oceanic events, such as El Niño/La Niña and the Pacific Decadal Oscillation, occur at multi-year or decadal time scales. Recently, scientists have made strides in understanding how El Niño/La Niña events and the warm and cool regimes of the Pacific Decadal Oscillation influence Oregon’s coastal and marine water ecosystem. Figure 6.6a. Average sea surface temperature for July (1997 – 2003). Note colder water nearshore. (Source: Juan-Jorda Masters Thesis/College of Oceanic and Atmospheric Sciences/ Oregon State University/2006. Figure 6.6b. Average sea surface temperature for January (1997 – 2003). Note warmer water nearshore. Source: Juan-Jorda Masters Thesis/College of Oceanic and Atmospheric Sciences/ Oregon State University/2006. Another water column component that affects Oregon’s neritic habitats is river plumes. CMECS does not characterize the marine waters affected by these plumes as estuarine because they are not meaningfully enclosed by landforms. Riverine waters entering the ocean often carry high concentrations of nutrients, create gradients in salinity, cause physical mixing, and create areas of high turbidity. Large river plumes, such as that from the Columbia River, may serve as a microhabitat within neritic habitats and can potentially act as biogeographic barriers between marine areas to the north and south. The Columbia River plume stretches hundreds of miles offshore and shifts predictably over the course of each year. In the summer the plume spreads south and offshore from the river’s mouth, while during the winter the plume is found to the north of the river mouth and is usually directly adjacent to the coast. This plume has important ecological effects, not only to neritic habitats, but to nearshore and offshore habitats as well. The oceanographic fronts created by the Columbia River plume in the marine systems generate productive conditions that attract many species of invertebrates, fish, seabirds, and marine mammals. Neritic habitats support two basic types of marine organisms: plankton and nekton. Planktonic organisms live in the water column and are incapable of swimming against currents, instead drifting with them. Plankton are often categorized as either phytoplankton or zooplankton. Phytoplankton are microscopic photosynthesizing organisms (e.g., diatoms), and are the primary producers that form the base of the marine food web. Huge surges in phytoplankton populations, known as “blooms,” are commonly associated with upwelling events. Zooplankton are heterotrophic organisms that range in size from microscopic single-celled organisms to enormous jellyfish a meter or more in diameter. Some plankton, called holoplankton, like many diatoms, copepods, krill and jellyfish spend their entire lives as drifters in the water column. Many species like sea urchins, mussels, crabs, some snails and many fishes have planktonic stages as eggs or larva, called meroplankton, before either settling to the bottom or growing large enough to be nekton. The CMECS biotic component uses these planktonic classes and subclasses to describe the open water neritic zone. They can be further refined by taxonomic groups and communities that are dominant in any given area of interest. 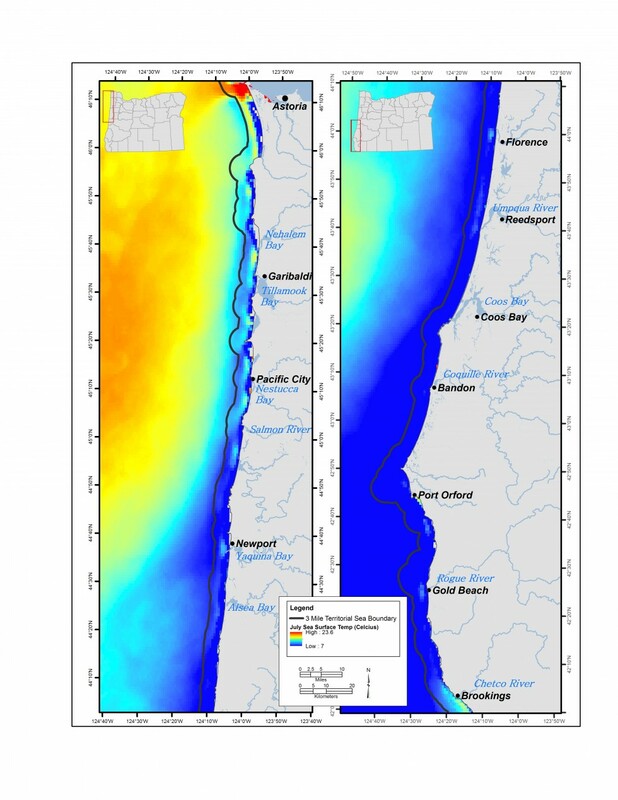 Dramatic changes in plankton communities occur in Oregon waters with water masses changes. For example warm water species are brought in to nearshore water with El Niño events. In contrast, nektonic marine organisms are capable of swimming against currents and include animals such as adult crustaceans, mollusks, and vertebrates. Highly migratory and schooling species are typical of nekton in neritic habitats. Many species of invertebrates, fish, birds, and marine mammals travel and forage exclusively or occasionally within this habitat. Many nearshore Strategy, Watch List and commonly associated species utilize the open water neritic habitat during their life history (Table 6.3, Appendix E and F). Many forage fishes such as northern anchovy, Pacific herring, topsmelt, surfsmelt, Pacific sandlance and longfin smelt feed in this open water neritic habitat. Juvenile rockfish are found in the water column. Breeding birds such as tufted puffin and common murre are central place foragers that feed on the forage fish and other species while nesting. In all, 59 of the 73 nearshore Strategy Species depend on this habitat for some phase of life. This is also the habitat that supports primary production by phytoplankton and secondary production by zooplankton, which is at the base of the food web for the nearshore ecosystem. Ocean currents transport and disperse larvae and juveniles of many invertebrate and fish species throughout the region. Human uses of the neritic habitat include commercial and recreational fishing, nonconsumptive recreational pursuits such as boating or whale watching, scientific research, commercial maritime transportation, and military operations. Development of renewable energy sources from both wind and waves is an emerging use of the neritic habitat. Phytoplankton, the microscopic algae that live in marine waters and drift with ocean currents, are a key component of the marine ecosystem. These primary producers at the base of the food web create the food directly consumed by many marine animals. The productivity of the marine waters off of the Oregon coast, like that of all ocean waters, is closely tied to this primary production of food from sunlight, water, carbon dioxide and nutrients by phytoplankton. Filter feeding bivalve shellfish such as clams, mussels, scallops and oysters extract and ingest these algae along with small drifting animals, called zooplankton, as they pump water through their bodies to feed and respire. Similarly, many forage fish species such as northern anchovy, Pacific herring and Pacific sardine feed on both phytoplankton and zooplankton. However some types of phytoplanktonic algae produce biotoxins that accumulate in animals that eat them causing illness and death in seabirds and mammals higher up the food web. Other types of these algae produce surfactant-like proteins that create foam on the water’s surface. Seabirds exposed to the foam lose the waterproof coating on their feathers which keeps them dry resulting in death from hypothermia or a restricted ability to fly. Problems occur when there are blooms of these types of algae. These harmful algal blooms (HABs) cause losses of natural resources, economic losses to coastal communities, and have resulted in human illnesses and deaths. Although these blooms largely occur in the open water habitats off our coast the effects of HABs are often most acutely felt along the shorelines. The most direct effects on people along the west coast of the U.S. result from biotoxins produced in two types of HABs. Blooms of dinoflagellates in the genus Alexandrium produce saxitoxin, a neurotoxin that causes paralytic shellfish poisoning in humans. Blooms of diatoms in the genus Pseudo-nitzchia produce domoic acid that causes amnesic shellfish poisoning in humans. Paralytic shellfish poisoning cases were first recorded on the west coast of North America in 1793, when members of Captain George Vancouver’s crew became sick after eating a breakfast of mussels collected from the shores of what is now British Columbia, Canada. Paralytic shellfish poisoning can cause death from respiratory failure due to paralysis. Amnesic shellfish poisoning causes gastrointestinal and neurological disorders in humans and can be life-threatening. Pseudo-nitzchia is known to have been present off the west coast since at least the 1920s, but the first documented outbreak of problems related to poisoning from domoic acid on the U.S. west coast occurred in 1991 with a die off of sea birds in California and contamination of razor clams and Dungeness crabs in Washington, Oregon and California. Although never confirmed, 25 cases of amnesiac shellfish poisoning were suspected in Washington during the 1991event. Monitoring for these HABs and sampling shellfish for food safety have resulted in closures or opening delays for both recreational and commercial shellfish fisheries in Oregon as well as in Washington and California over the years. Fisheries for razor clams, California mussels, Dungeness crab, northern anchovy and several other species have been affected. These closures have had economic consequences for coastal communities, but are necessary for public safety. Monitoring efforts can be conducted at two levels: sampling waters to monitor the phytoplankton for HABs and sampling organisms that consume phytoplankton to monitor for the accumulation of the disease causing toxins. The Oregon Department of Agriculture currently monitors several species of shellfish for accumulation of biotoxins. From 2005 to 2012, ODFW in collaborations with OSU, UO and the NOAA Northwest Fisheries Science Center utilized funds from a federal to develop an integrated HAB monitoring and event response program. 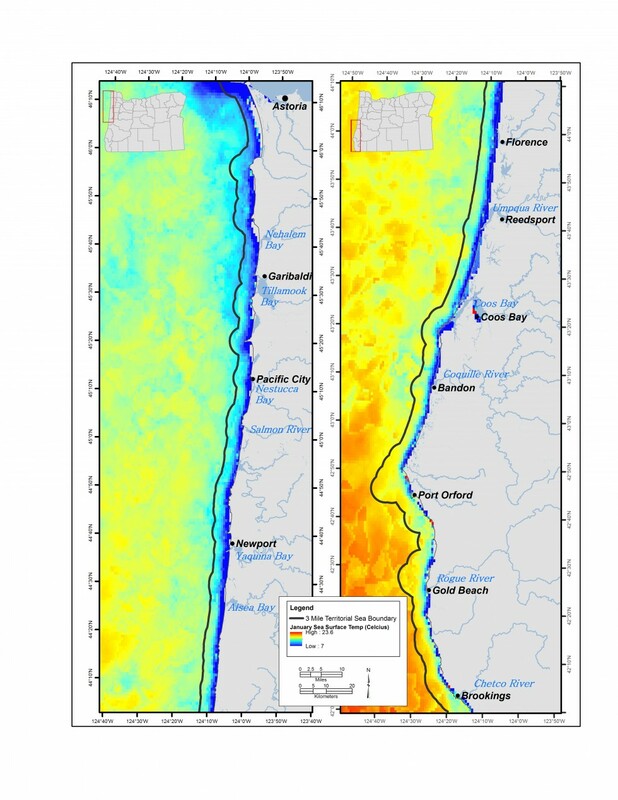 For ODFW, this resulted in monitoring phytoplankton directly at ten sites along the Oregon coast which provided ODA with an early warning system about potential HAB events. This work also stimulated collaborative research leading to insights into the occurrence of HABs off our coast. Oregon has not directly sampled its coastal waters for HABs since 2012 due to a lack of ongoing funding to do so. To assure human safety, monitoring of selected bivalve shellfish species for biotoxins by ODA continues in Oregon and has expanded in scope to include Dungeness crab for the foreseeable future due to events in 2015 and early 2016. Information about recreational harvest closures for shellfish can be found on the ODA website. While HABs are often localized events, research suggests that the frequency and spatial extent of HABs off the west coast has increased over the last several decades. A geographically extensive and long lasting bloom of Pseudo-nitzchia that affected marine wildlife and fisheries along the west coast began in the spring of 2015. The bloom stretched from Alaska to California and persisted far longer than what is considered normal. Scientists called this an unprecedented event. Some west coast fisheries remained closed through May of 2016. NOAA‘s Northwest Fisheries Science Center provides an excellent overview and more information on HABs.